this class provides an interface to a CVector<C_FLOAT64>, or indeed to any container class that has a size() method and a  operator that returns C_FLOAT64. Definition at line 148 of file CCopasiArray.h. Definition at line 152 of file CCopasiArray.h. References CCopasiVectorInterface< VectorType >::mSizes, and CCopasiVectorInterface< VectorType >::mVector. Definition at line 159 of file CCopasiArray.h. Definition at line 190 of file CCopasiArray.h. Definition at line 161 of file CCopasiArray.h. Definition at line 169 of file CCopasiArray.h. Definition at line 182 of file CCopasiArray.h. Definition at line 179 of file CCopasiArray.h. Referenced by CCopasiVectorInterface< VectorType >::CCopasiVectorInterface(), and CCopasiVectorInterface< VectorType >::size(). Definition at line 178 of file CCopasiArray.h. 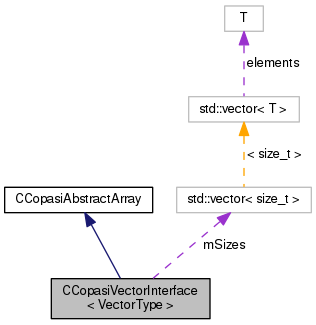 Referenced by CCopasiVectorInterface< VectorType >::CCopasiVectorInterface(), CCopasiVectorInterface< VectorType >::operator(), and CCopasiVectorInterface< VectorType >::size().